In the Mail: What a Haul! 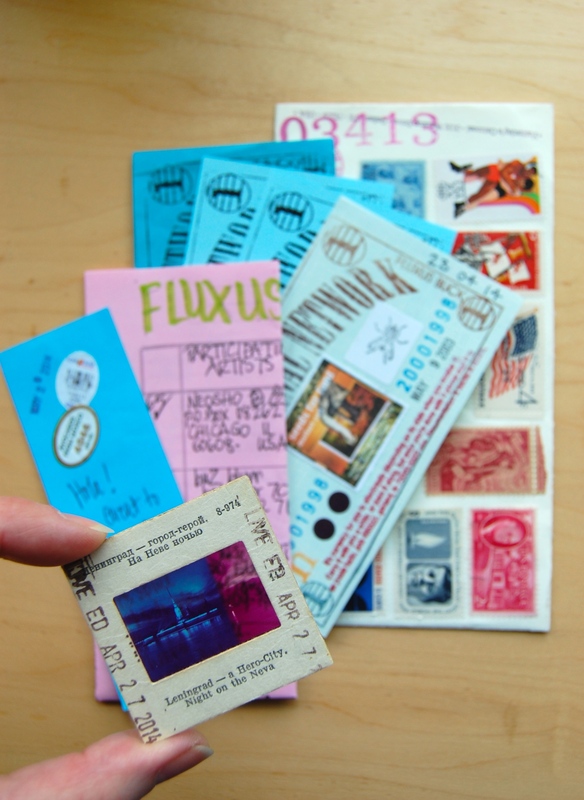 Just look at all the mail I’ve received since our last ‘In the Mail’ post and you’ll being saying, “WOW!” too. 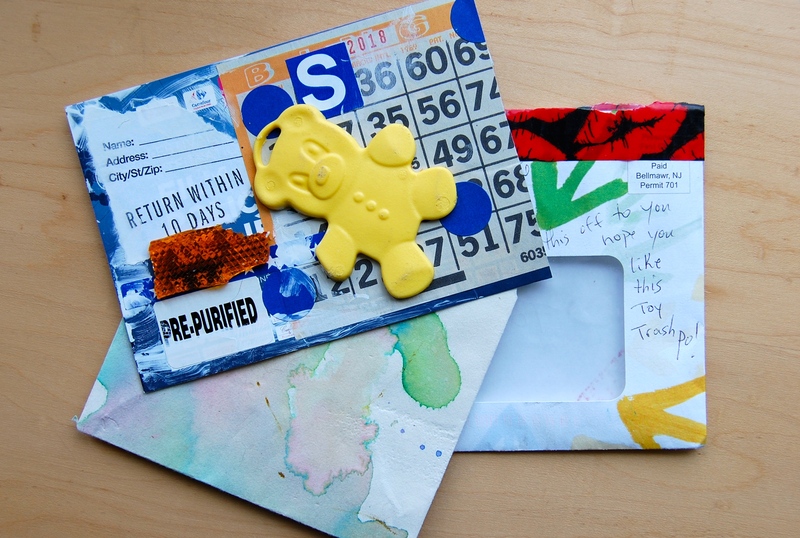 Arriving in an envelope made from what looks to be a kitschy, glossy magazine page, Amy Irwen’s packing tape transfer/collage was built on a piece cut from a cracker box. ‘The lone weed will tumble thousands of miles.’ It put me in mind of the movie, ‘You’ve Got Mail,’ specifically the scene where Frank is writing a piece about Kathleen’s Shop Around the Corner. He types away… “You are a lone reed, standing tall, waving boldly, in the corrupt sands of commerce.” Thank you, Amy! 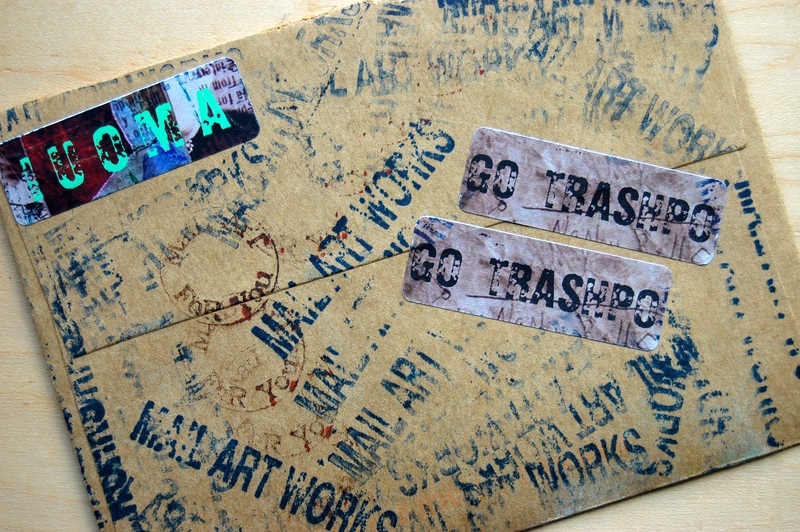 Reusing an envelope from Google Headquarters, Diane Keys (http://dianekeys.blogspot.com/) mailed me a piece of what she calls, “Toy Trashpo.” It made me smile like only DK’s trashpo can! A sensory delight, it must have been “PRE-PURIFIED” with patchouli because my nose was in Heaven! The reverse reveals that the piece was built upon a advertising postcard. Nothing goes to waste in the Elgin Mansion. Thank you, ever so, Diane! 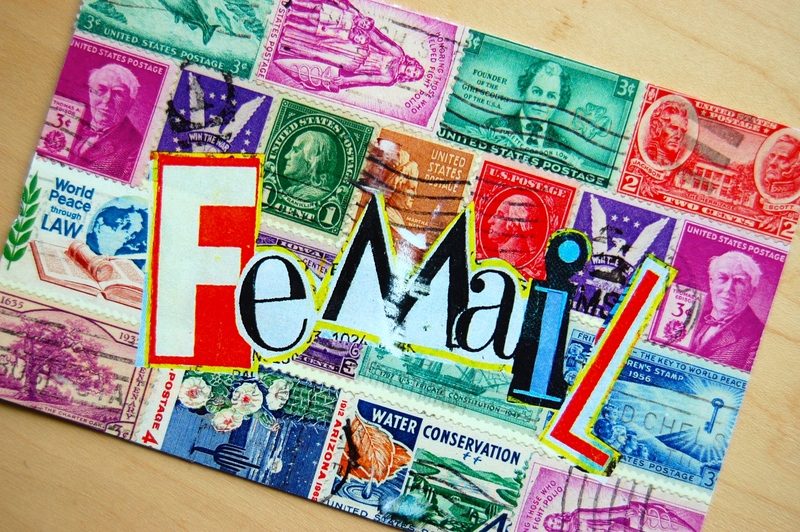 Folks in Germany produce some phenomenal mail art. 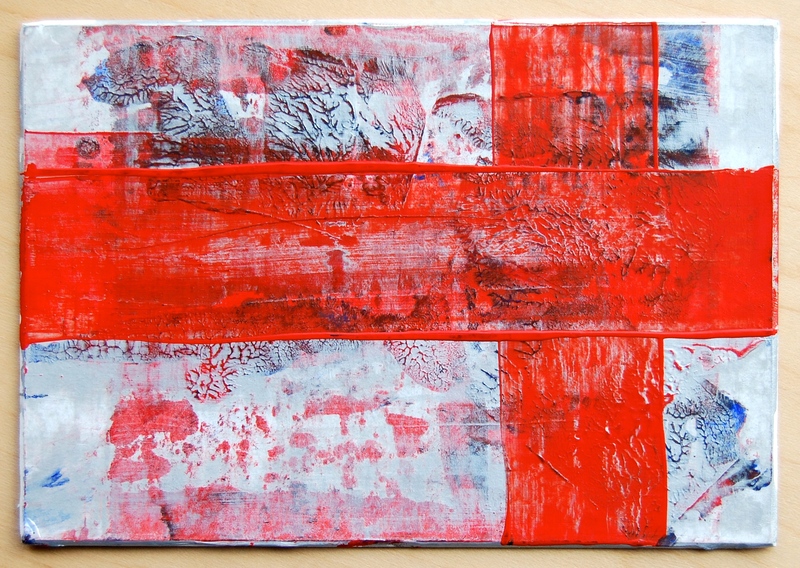 This piece is from Funf Blanks (http://www.5blanks.com/) It appears to be acrylic on a piece of discarded mat board. Great texture here! That reminds me, I have yet to submit to the Angels and Demons mail art call…. The stamps on the back are awesome too! 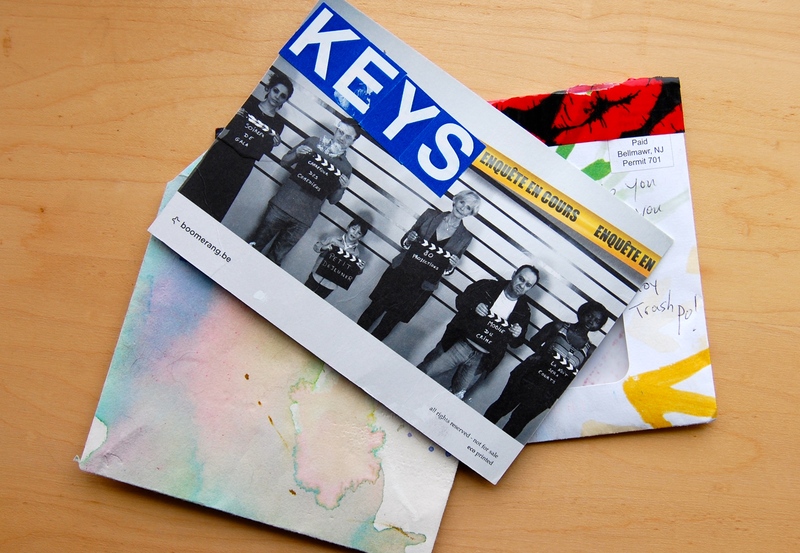 Ana Karina sent me this wallet of goodies inside a brightly painted envelope. 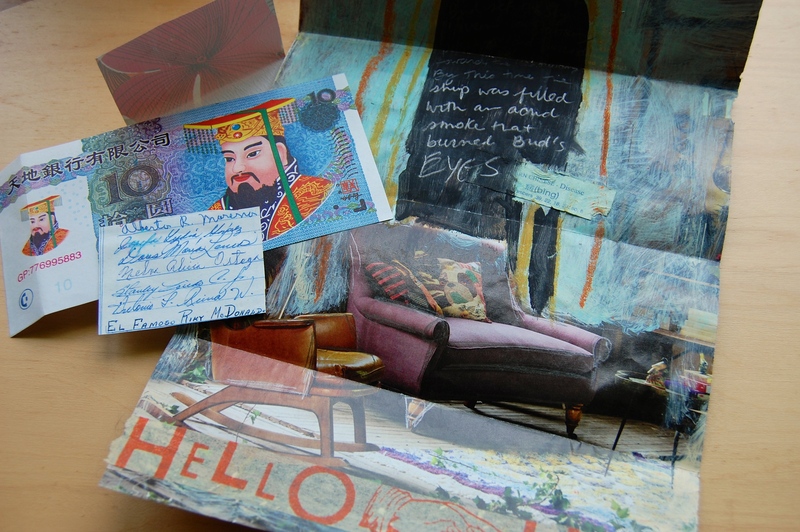 Opened, it reveals a cool magazine page turned collage/poem, a 10 Yuan note from HELLBANK ONE (LoL!) and a scrap of signatures containing that of ‘EL FAMOSO RIKY McDONALD.’ Thanks, Ana! 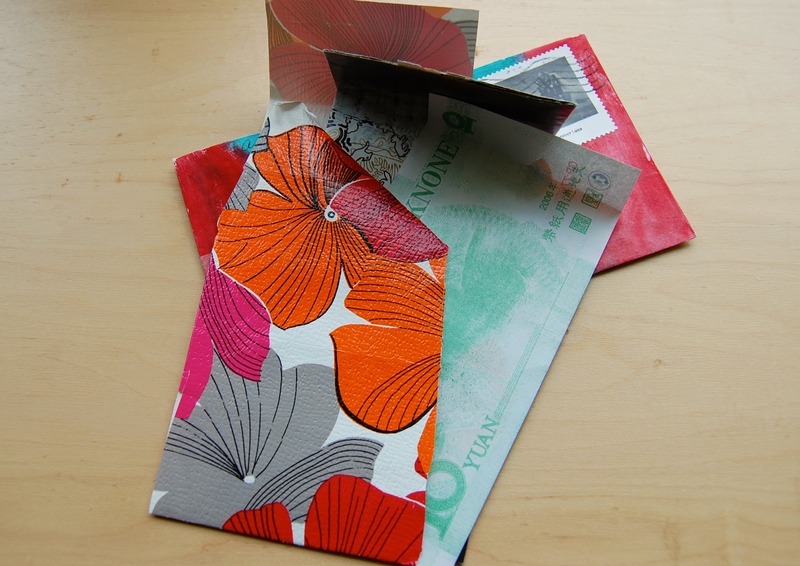 Speaking of wallets… this one, filled with FLUXUS BUCKS and scented with more patchouli (Yay! Nose twitching!) came from Julie Jefferies. The slide of Leningrad made for a tremendous photo op! 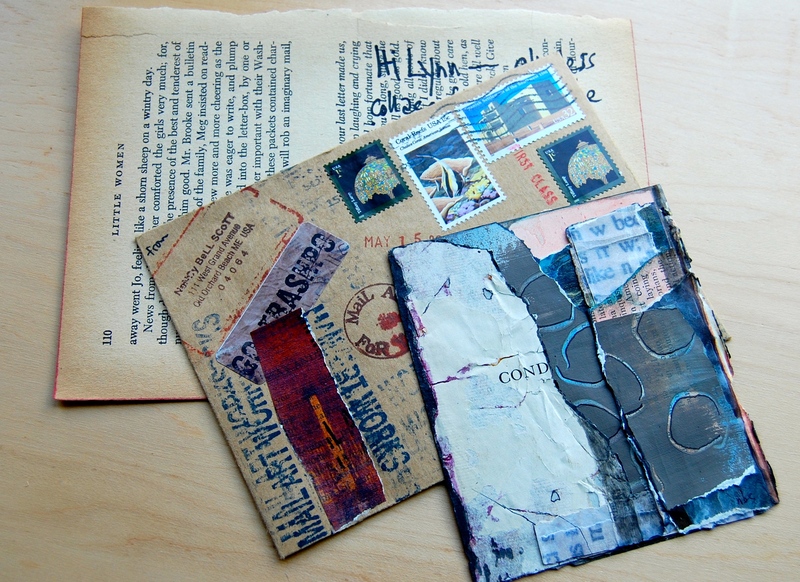 I simply loved that the postage was made up of vintage postage stamps! Many thanks to Julie at Fluxus Bucks International! Karen Arp-Sandel (http://karenarpsandel.com/) returned a piece to me from FeMail. 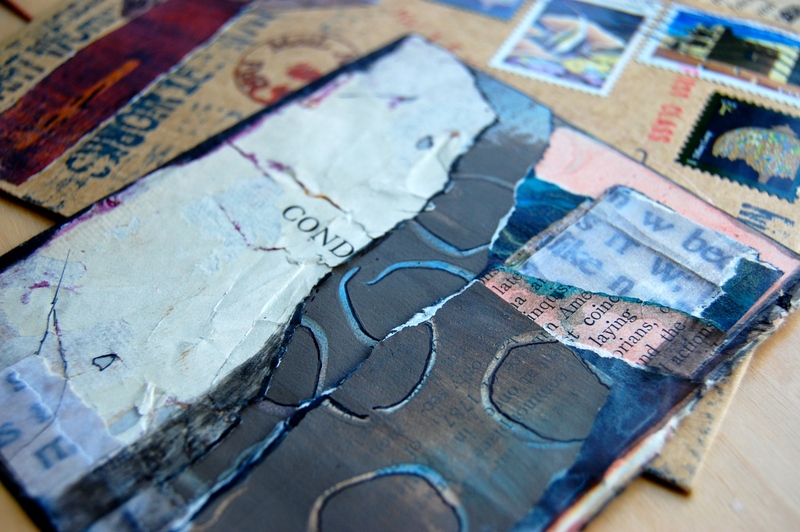 A pre-printed postcard of a postal collage, the front was nothing in comparison to the back! Karen actually took the time to customize the piece with a bit o’ trash, referencing the piece I’d sent and letting me know she’d taken time to learn a bit about me. Way cool, Karen! 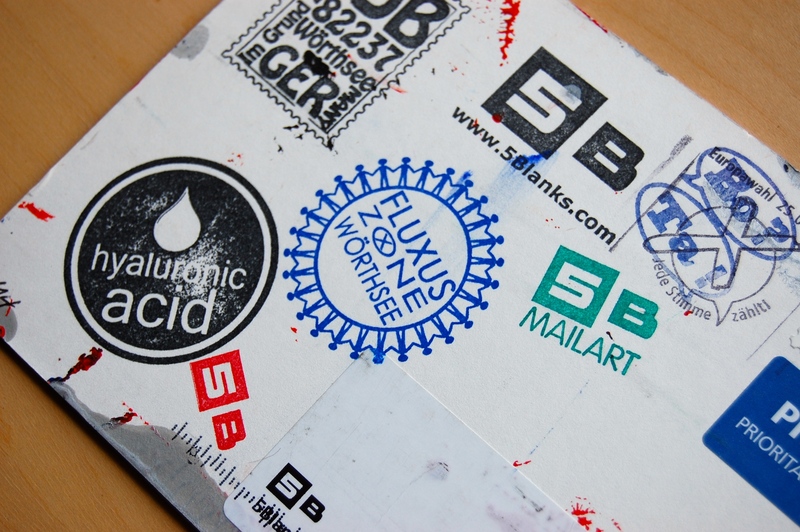 Thomas Brown creates some fantastic rubber stamps and this is no exception! The colors aren’t quite true in this photo, but you get the idea. Thanks, Bhomas! 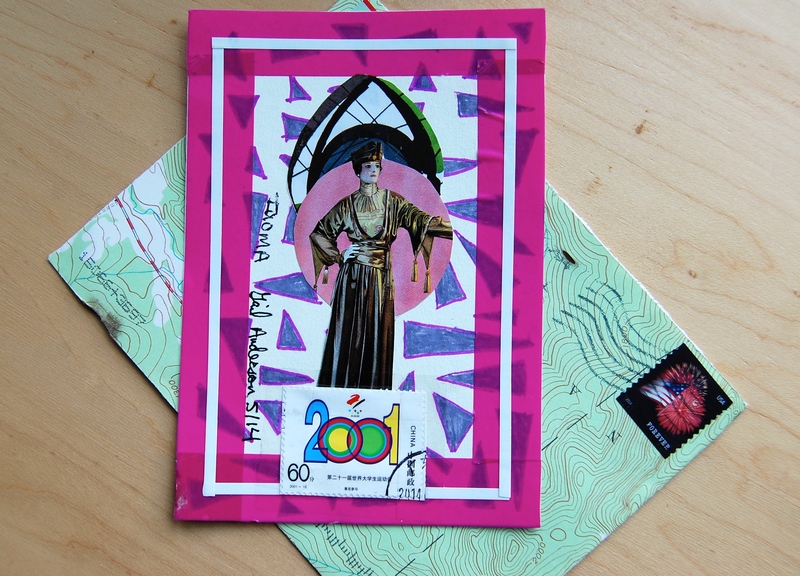 Gail Anderson used a topographical map to create the envelope in which she sent this unusual collage piece. Layers of doodling, images and tape made this one pop! Thank you, Gail! 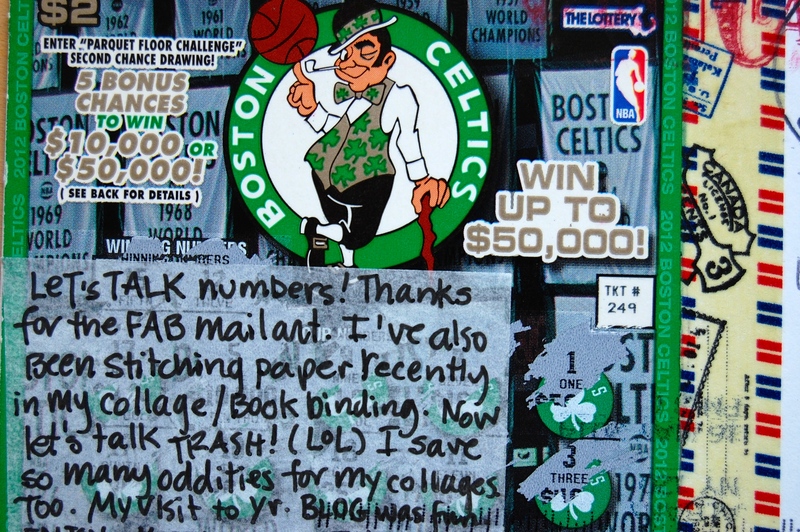 Last, but not least, Nancy Bell Scott is one of those folks from whom I long to get mail. Her pieces are few and far between, but when they arrive, they are always over-the-top! 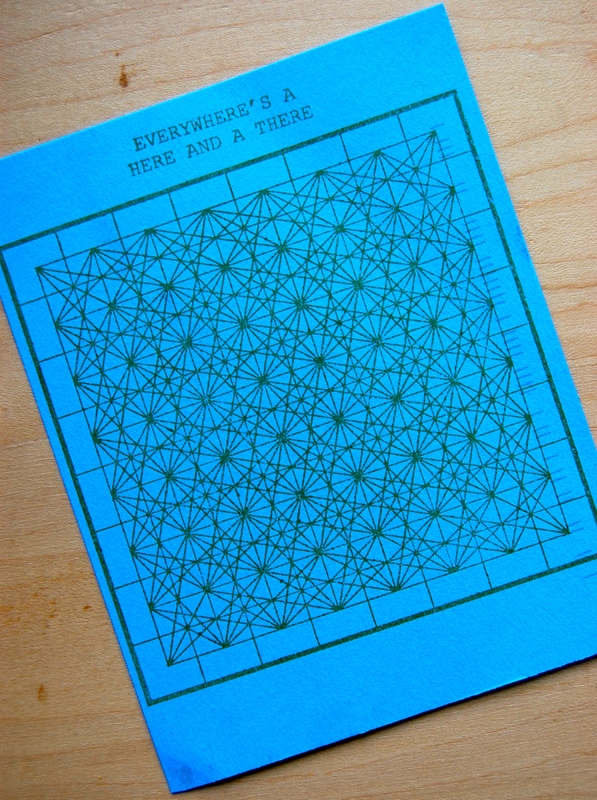 Check it out… this is the back of the envelope! ‘Conduit’ is comprised of multiple layers creating rich texture. Thanks, Nancy! That’s all for now. I’ve got to get caught up on a few things before revealing any more! 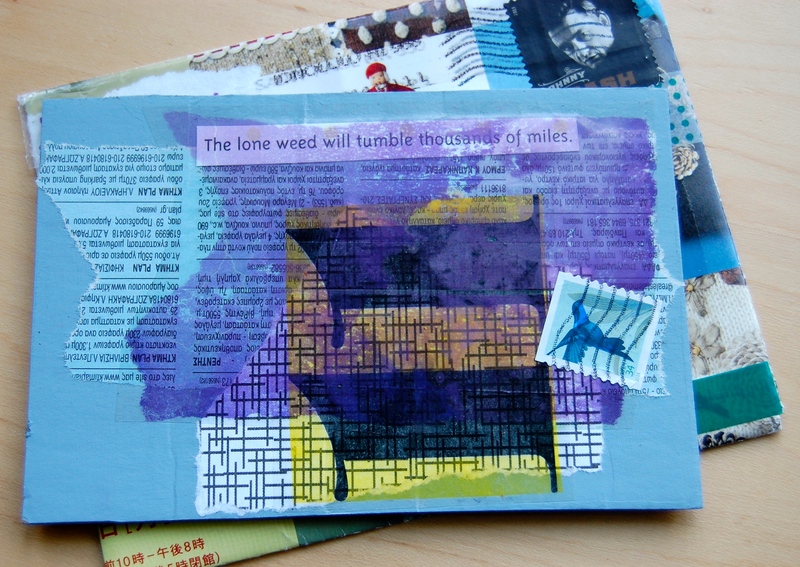 This entry was posted in In the Mail and tagged acrylic paint, Amy Irwen, Ana Karina, art, Authentic DKULT Trash, Bhomas Trown, collage, Diane Keys, FeMail, Fluxus, Fluxus Bucks International, Funf Blanks, Gail Anderson, handmade envelopes, International mail art, Julie Jefferies, Karen Arp-Sandel, kitschy, Mail Art, mixed-media, Nancy Bell Scott, packing tape transfer, rubber stamps, Thomas Brown, Trash Po, trash poetry, vintage postage by lkr1995. Bookmark the permalink.